The Secretary Bird or Secretarybird, Sagittarius serpentarius, is an extraordinary large, mostly terrestrial bird of prey. Origin of its name: There are a couple of potential origins of its name. One explanation was that it was named after the crest of long feathers at the back of its head that resemble quill pens that 19th century clerks stuck in their wigs. But recent findings indicate that its name was derived from the Arabic "saqr-et-tair", meaning hunter-bird, which also translates into French as "secretaire". Endemic to Africa, it is usually found in the open grasslands and savannah of the sub-Sahara. It is a large bird of prey in the order Falconiformes, which also includes many other diurnal raptors such as kites, buzzards, vultures, and harriers, but it is so distinctive that it is given its own family, Sagittaridae. 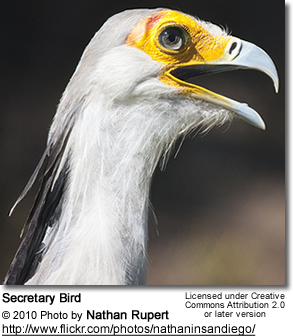 The Secretary Bird enjoys a certain fame in Africa, specifically Sudan and South Africa, where it serves as a prominent Emblem on both countries' Coat of Arms. The Secretary Bird is instantly recognizable as having an eagle-like body on crane-like legs which increases the bird’s height to around 1.3 m (4 ft) tall. This 140 cm (4.5 ft) long bird has an eagle-like head with a hooked bill, but has rounded wings. Body weight averages at about 3.3 kg (7.3 lbs) and the wingspan is over 2 m (6.6 ft). Due to its long legs and long tail, it is both longer and taller than any other diurnal raptor. 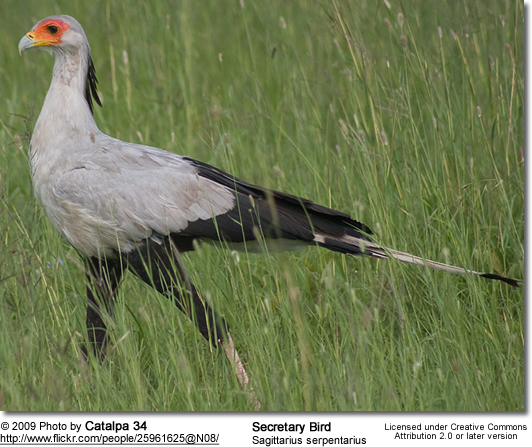 Indeed, the Secretarybird has the longest legs of any raptor, and it must bend its legs in a crouch to feed or drink .The lower legs of Secretarybirds have heavy scales that may protect them while walking through the brush or when attacking their prey. From a distance or in flight it resembles a crane more than a bird of prey. The tail has two elongated central feathers that extend beyond the feet during flight, as well as long flat plumage creating a posterior crest. 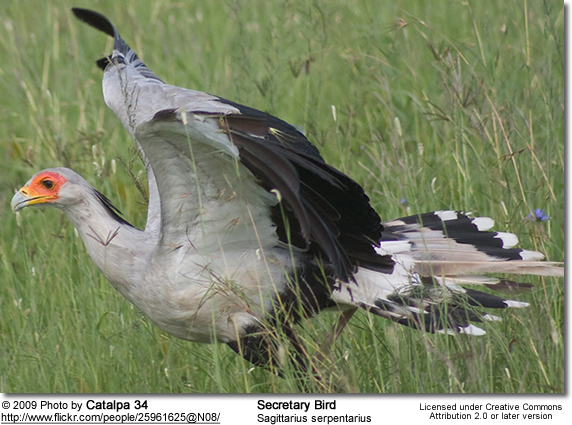 Secretary Bird flight feathers and thighs are black, while most of the coverts are grey with some being white. Sexes look similar to one another as the species exhibits very little sexual dimorphism, although the male has longer head plumes and tail feathers. Adults have a featherless red face as opposed to the yellow facial skin of the young. They can run so fast that they are sometimes referred to as "the devil's horse." They are excellent flyers, but they have a hard time getting off the ground. They have to make a long run with wings outspread before becoming airborne. That may be the reason why they appear to prefer running to flying. 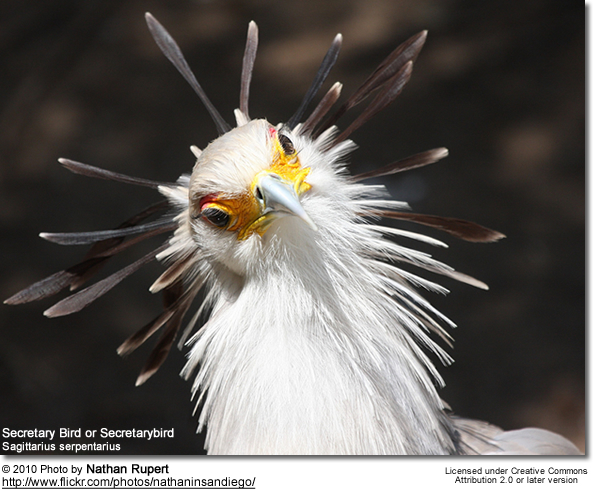 Secretary Birds are endemic to sub-Saharan Africa and are non-migratory (although they may follow food sources). Their range is from Senegal to Somalia and south to the Cape of Good Hope. These birds are also found at a variety of elevations, from the coastal plains to the highlands. Secretary Birds prefer open grasslands and savannahs rather than forests and dense shrubbery which may impede their cursorial existence. While the birds roost on the local Acacia trees at night, they spend much of the day on the ground, returning to roosting sites just before dark. 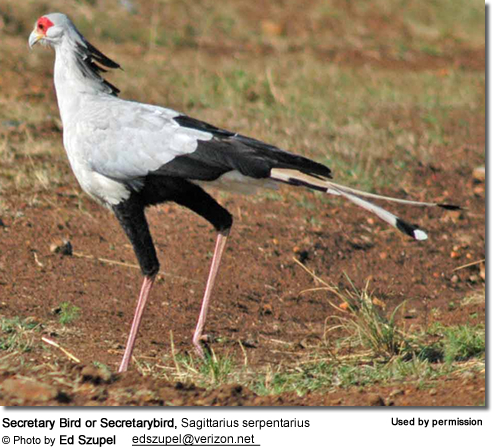 The Secretary Bird is largely terrestrial, hunting its prey on foot, and other than the caracara (such as Caracara plancus), is the only bird of prey to do so habitually. Adults hunt in pairs and sometimes as loose familial flocks, stalking through the habitat with long strides. Prey consists of insects, small mammals, lizards, snakes, young birds, bird eggs, and sometimes dead animals killed in wildfires. 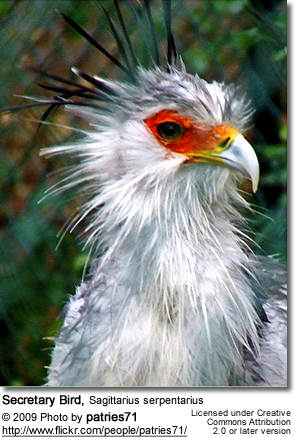 Some secretary birds are kept on African farms to keep the snake population in check. Larger herbivores are not hunted, although there are some reports of Secretary Birds killing young gazelles. 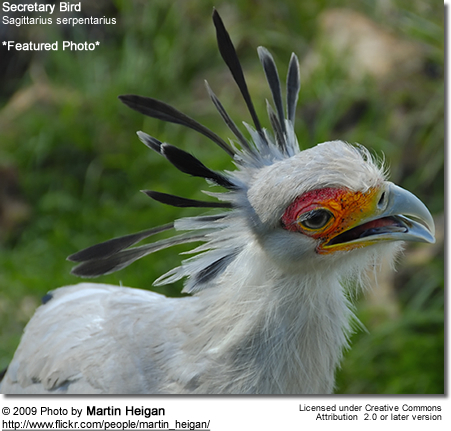 Secretary Birds have two distinct feeding strategies that are both executed on land. They can either catch prey by chasing it and striking with the bill, or stamping on prey until it is rendered stunned or unconscious enough to swallow. Studies of this latter strategy have helped reconstruct the possible feeding mechanisms employed by the dinosaur-like 'terror birds' of five million years ago. When Secretary Birds find a snake, they will either kill them with a powerful forward kick or they seize them with their claws and strike them on the back of the neck with the beak. They may use beak, wings and feet to kill a large snake. They use their wings wings as shields to keep from being bitten. Small prey are picked up in the bill and swallowed. 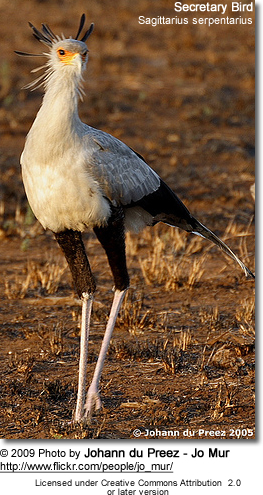 The Secretary bird stamps its feet on the ground to flush out prey. In hunting and feeding on small animals and arthropods on the ground and in tall grass or scrub, Secretary Birds occupy an ecological niche similar to that occupied by peafowl in South and Southeast Asia, roadrunners in North and Central America and seriemas in South America. 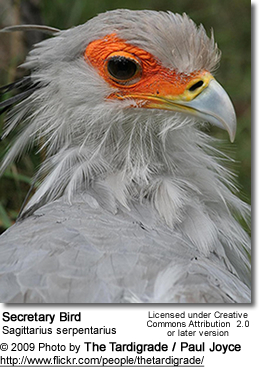 Secretary Birds associate in monogamous pairs. During courtship, they exhibit a nuptial display by soaring high with undulating flight patterns and calling with guttural croaking. Males and females can also perform a grounded display by chasing each other with their wings up and back, much like the way they chase prey. They usually mate on the ground, although some do so in Acacia trees. Nests are built at a height of 5–7 m (15–20 feet) on Acacia trees. Both the male and female visit the nest site for almost half a year before egg laying takes place. The nest is around 2.5 m (eight feet) wide and 30 cm (one foot) deep, and is constructed as a relatively flat basin of sticks and branches, lined with grass. Instead of building a new nest each year, they add a new layer of grass. Secretary birds lay two to three oval, pale-green eggs over the course of two to three days, although the third egg is most often unfertilised. These eggs are incubated primarily by the female for 45 days until they hatch. During this time, she is fed by her mate. 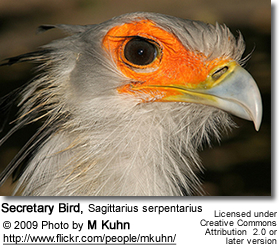 The Secretary Birds are facultatively fratricidal. There are conflicting opinions on this phenomenon also called Cainism - "No evidence [exist] of sibling aggression, but youngest in brood of 3 almost always dies of starvation..." Considering that the 2 parents must provide food for 3 chicks at a rate of one feeding per hour after day 17 after incubation, one can understand why the last of the chicks to hatch has the least chance of survival. The downy young can feed autonomously after 40 days, although the parents still feed the young after that time. Both the parents feed the young. At 60 days, the young start to flap their wings, and by day 65-80 are able to fledge. Fledging is accomplished by jumping out of the nest or using a semi-controlled fall via fervent wing flapping to the ground. After this time, the young are quickly taught how to hunt through expeditions with their parents and are considered independent soon after. Young are predated by crows and kites as they are vulnerable in Acacia tree tops. 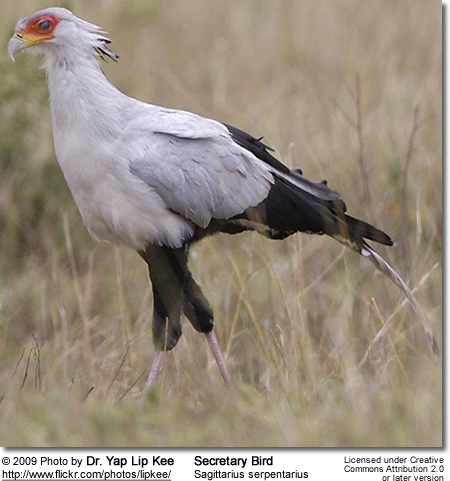 As a population, the Secretary Bird is mainly threatened by loss of habitat and deforestation. In 1968 the species became protected under the Africa Convention on the Conservation of Nature and Natural Resources. Nevertheless the species is still widespread across Africa, and has adapted well to arable land where prey animals such as rodents are more common than in traditional habitat. The species is well represented in protected areas as well. Secretary birds are almost completely silent birds, except for a rare croaking sound they utter when displaying. The Secretary Bird has traditionally been admired in Africa for its striking appearance and ability to deal with pests and snakes. As such it has often not been molested, although this is changing as traditional observances have declined. 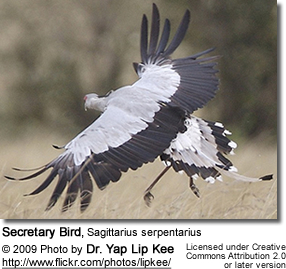 The Secretary Bird is the national emblem of Sudan as well as a prominent feature on the Coat of arms of South Africa. In Sudan, it is featured in the middle white strip of the Presidential Flag; it is the main object on the Presidential Seal, and features heavily in Sudanese military insignia. The Secretary Bird on the Presidential Flag and Seal has its head turned to the right, with its distinctive crest clearly visible and its wings spread out with a white banner between its outstretched wings reading "Victory is Ours". 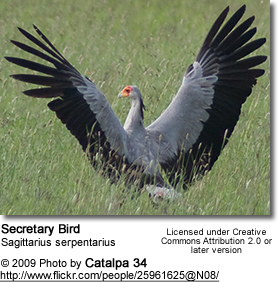 In South Africa, the Secretary Bird, while not the official bird, is featured as a symbol on the national coat of arms, representing vigilance and military might, as well as the rise and pride of modern South Africa. The Secretary Bird has been a common motif for African countries on postage stamps, over 65 stamps from about 30 countries are known as of date including some from stamp-issuing entities such as Ajman, Manama. the Maldives and the United Nations where the bird does not occur. First described by English illustrator John Frederick Miller in 1779, the Secretary Bird was soon moved to its own genus, Sagittarius, by French naturalist Johann Hermann in his Tabula Affinatum Animalium. It was not until 1935 that the species was moved to its own family, distinct from all other birds of prey—a classification confirmed by molecular systematics. Recent cladistic analysis has shown Sagittariidae to be an older branch of the diurnal birds of prey than Accipitridae and Falconidae, but a younger divergence than Cathartidae. 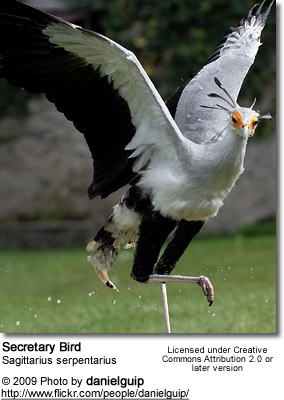 Sometimes, the enigmatic bird Eremopezus is classified as an early relative of the secretary bird, though this is quite uncertain as the bird is only known from a few fragmentary body parts such as the legs. Its common name is popularly thought to derive from the crest of long quill-like feathers, lending the bird the appearance of a secretary with quill pens tucked behind his or her ear, as was once common practice. A more recent hypothesis is that "secretary" is borrowed from a French corruption of the Arabic saqr-et-tair or "hunter-bird." 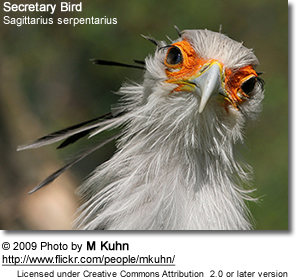 The generic name "Sagittarius" is Latin for "archer," perhaps likening the Secretary Bird's "quills" to a quiver of arrows, and the specific epithet "serpentarius" recalls the bird's skill as a hunter of reptiles. Copyright: Wikipedia. This article is licensed under the GNU Free Documentation License. It uses material from Wikipedia.org ... Additional information added by Avianweb.